Head nods. Hugs with relative strangers. Tighter hugs with good friends. Texts and phone calls coming in at ridiculous rates. Purple as far as the eyes can see. Sore throats. Use any measurement to try and capture Northwestern’s 68-66 NCAA Tournament opening-round thrilling win and it points to extremes. Any one reading this knows what happened in the game. Bryant McIntosh’s 25-point clinic and incredibly clutch pressure free throws will be mere footnotes for most college hoops fans who will remember “the foul” by Matthew Fisher-Davis, who infamously fouled B-Mac up by one point. It’s a moment that unfortunately will stick as THE image, but that is a disservice to this game. As Wildcat die hards, I’m going to choose to focus on all the goodies in the rest of the game and the day. The nuances of being there in person start and end with an electric, dominating sea of purple. The Basketball Rose Bowl was in full effect. As most of us were literally shaking and physically nauseous from the game’s waning moments, the 1.1 seconds separating us from staying in Bracketville were just nuts. After Sanjay sunk a free throw that he tried to miss, Vandy’s full-court heave seemed to take about 3 minutes. During the flight of that potential miracle buzzer beater, time stopped. The movie montage of images from the day were brought to the forefront of my brain. The night before the game, a couple hundred purple-clad folks had overtaken Squatter’s restaurant and bar, thanks to a simple email trail that the LTP fan base had sent out. I had chalked up my stay as a win then and there. However, nothing prepared me for Thursday’s feelings. Northwestern threw an official tailgate party at a bar near the arena, slated to open at 10 am. By 10:10 the 800-person venue was packed. Wisely, the NU brass had scrambled the night before to secure an equal-sized location, Lumpy’s. Within 30 minutes, this fantastic venue was packed as well. The combination of the incredible venue, the packed house of purple and screens with March Madness going, well, hundreds tried to capture the moment with their phones. It looked like a rock concert and we were all 16-year-olds. This was the overflow tailgate bar, 15 minutes after opening time. The marching band came in, the fans went nuts and they played the “It’s Time” video from Selection Sunday. Goosebumps matched pints of beer possibly 2:1. Then, Mike Greenberg took to the stage and welcomed the fans with a speech that I hope is floating around social media right now. He talked about the future of Northwestern basketball and the amazing things in front of us. He articulated brilliantly the turning point of our history and emphatically pointed out that nothing that comes ahead can outdo what this team’s legacy will mean. Family members were in attendance and it was just so, emotional. Michael Wilbon followed and had fun poking jabs at Vanderbilt grad Skip Bayless. Jim Phillips followed and talked about the Northwestern approach and all of the academic and not athletic accomplishments that mean so much more than basketball, but for one day, this day, we’re putting hoops above all else. This wasn’t a basketball game, it was a love fest for a school and a community that had captured the country’s March Madness imagination. As if we needed a generational stamp of how once-in-a-lifetime this was, there was 1995 Big Ten football champion hero, Darnell Autry, trying to capture it all on his Iphone. One of us, now, understanding the significance of the moment. Jim Phillips and the “real” Mike & Mike crushed it hitting all the right notes to fire up the crowd and capture the significance of THE MOMENT. The entire town seemed to be gawking at us with a smirk. Gonzaga fans approaching us. Arizona fans. Random strangers walking up to us feeling compelled to welcome us to the club and share just how happy they were that Northwestern was here. It was if they won the fan lottery ticket, securing America’s Cinderella in their bracket. Ohio State at Ryan Field. That’s what this invasion of purple felt like. The concourse was majority purple. We sat and watched Gonzaga and collectively all had the same thought – “if we can beat Vandy, we have a chance against this team.” The idea of playing a 1-seed as part of our Cinderella script seemed too much fate for us not to lose, right? As the game wore down, the purple continued to overtake the lower bowl and upper arena. The buzz was building. General hoops fans around us proclaimed “we’re with you guys today”. I was sitting in section 9, one section over from the strip of purple behind the bench. Fitz was a row in front of me, Julia Louis-Dreyfus…well, you know where she was sitting, but it was the same row. I felt like I was in a dream looking one section over and seeing Northwestern’s history come to life, one by one. Brian James and some of the staff tried to be incognito in the stands soaking it all in. And then, the moment arrived. Northwestern took the floor and the arena erupted. It was the hoops equivalent of NU taking the field at the Rose Bowl. About 70% of the fans in the arena went nuts and you thought “holy crap, look at how many people are here for us.” We knew it was a home game. The game as you now know it by heart unfolded. B-Mac on fire and our team coming out ready for business. A terribly officiated game made it choppy at times and both teams having stretches of sloppiness that made it far from a clinic, but yet, everything seemed so damn beautiful. When Gavin Skelly fell to the ground after making a basket and getting fouled he let out a primal scream. I made a mental note that might be our One Shining Moment clip. The arena didn’t have a bad seat in the house. Yet, there was zero information about other games. Not one March Madness score from another game. Not one highlight. It seemed intentional to keep every one so focused on the moment. Vanderbilt had so few fans, every single timeout featured jumbotron shots of Northwestern fans. The single loudest moment may well have been during a timeout in the first half when they played the Northwestern University PSA. The entire arena stood and went nuts. Head nod city. Back to the ball in the air. It touched every freakin’ emotion. The old school mentality of “omg, that is going in” actually happened. The new school mentality of “this is going to miss and we’re about to have the biggest party SLC has ever seen.” Well, the latter as you know happened. After photos, selfies, social media posts and responses to the outside world, we all stayed and soaked in the moment. Chris Collins’ high school buddies in the front row behind the bench took their selfie and we watched the players come over to the fans and simply orchestrate ovations as if they were the football quarterback directing the band. Then, it got equally crazy. I had sent an email to my LTP die hard friends earlier in the day that win or lose, we had reserved a floor of Gracie’s bar. “Spread the word, all ‘Cats fans welcome” was the directive. The bar told me that if we had 100 people, they could keep us closed off with all purple. Then, as we walked the six or so blocks to the venue (and fans yelled out Go-U, N-U), something magical happened. The line was more than half a block long to get in. The entire bar became instantly filled with Northwestern fans. Upstairs, downstairs, every nook and cranny. Man hugs. High fives. Quirky beer orders (no pitchers allowed) and – boom – it was Sailgate west. Who knows what the head count was on the day. We stayed for hours. Guys begged for hall pass extensions from their wives. Hotel extensions and flight arrangements were the norm. Rose Bowl comparisons became the talk of the day. Look what we did to Gracie’s post game! We had won. It was starting to sink in. Unlike the Rose Bowl, where the preamble was the win, we have 48 hours to revel in victory and national relevance. I felt pained for my good friends who couldn’t physically be here. I choked up as BTN’s Dave Revsine told me he wore his father’s (a well-known former Northwestern professor) watch so a piece of him could experience it. This was one of those moments none of us will ever, ever forget. Whatever happens from here on out, we’ve crossed through the other side. All of us are touting our all-time best NCAA Tourney record, ahead of number two Indiana, who just had their coach fired, placing our program squarely ahead of Indiana in the current status of college basketball. An insane statement to make from where we’ve come from. There was Wilbon and Adande and Nichols and dozens of former players and hundreds and hundreds of Wildcat fans not wanting the moment to end. Finally, I had hit the wall. I tapped out and had to go home. I was exhausted as if I’d played the game. Emotionally spent. I tried to quietly depart as a strong, but thinning crowd that had been there for four hours plus was going to soak it all in. Fans, we’re playing a 33-1 #1 seed Gonzaga. This is happening. Now, it’s off to watch more March Madness this St. Patrick’s Day afternoon. Lumpy’s…watch out. We’re coming to you today and the purple invasion is just getting started. For anyone that has a pair of tickets for Saturday, let me know. I’m on the hunt and looking to stay in Bracketville as long as I can. LTP, excellent post. My wife married into Northwestern fandom and yesterday was her first college basketball (or football) game ever. Your description of fans “literally shaking and physically nauseous from the game’s waning moments” describes me, but even more so, her, as she was perfectly initiated into Cardiac Cats fandom. Is NU (or are you) putting on a pre-game event tomorrow in SLC? Oh man, Sam. That is insane! NU put on the alumni event at the same venue. Love it! Some of my friends were there and got photos with Darnell and posted them on social media. I was at the Rose Bowl, and I am so regretting not being in SLC. Work responsibilities, pricey flights from Boston, went to the Big Ten Tourney last week, blah, blah blah, it’s not like I am getting any work done anyway! Great write-up. Thanks for attempting to make me feel like I was there! Nearly every year in the Men’s NCAA tourney a #1 seed drops a stink bomb in the second round. Why can’t it be Gonzaga this year? We missed you Rockstar. Block off mid-March next year – destination TBD. I think it might even be bigger once the Salt Lake posse spreads the word. Current junior at Northwestern here…A couple friends and I flew out to Salt Lake after we finished our finals. Two coolest parts of yesterday were: 1) Fitz pumping up the crowd during any tense moment. At one point he stood on the railing in the aisle and yelled at people to stand up. At no other school could I see that happening. 2) Did you see the number of YOUNG alumni there? 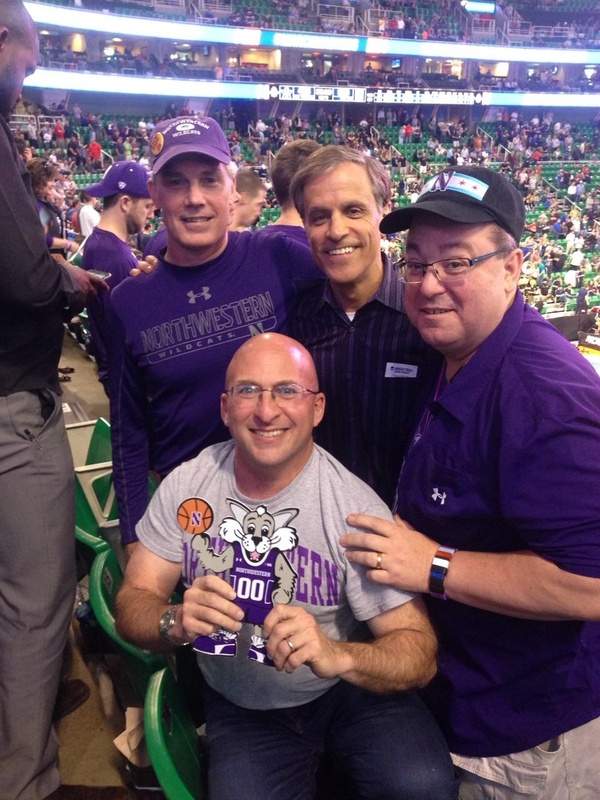 There is a new generation of Northwestern alums who are huge cats fans after seeing consecutive nearly a decade of a competitive football team and steady improvement with the basketball team. I’m excited to see where this journey will go…beat Gonzaga and Evanston may burn down Saturday night. So glad you made the trek. You’ll never forget it! And yes, saw Fitz – he was a row in front of me. It was awesome. Outstanding! I was there through you Thanks so much for this memory Alan. Go CATS!! I remember what will soon be the old old McGraw hall dirt track and all. We’ve arrived and it feels good. Playing with house money, bring on the zags. Though sadly back in sf not still in slc for me but there in heart! Btw talk about loose did u see the bench dancing at open of 2h? Thanks for setting he event up Thursday night, LTP, and for the recent posts. You’re speaking for hundreds of Cat fans who have rooted for this team and it’s predecessors over the years. Hope to see you at today’s pregame bash. I am sending a donation now (and hope others do too) so your girls can make it next time. Mine are at home too and wish they could be here too. Go Cats!!! You are too kind. The donation function is down, however. Please put the money to YOUR girls! I did not realize that LTP came out of retirement for the tourney and are only now seeing this 8 months later. Reading this gave me goosebumps. I could not be in Salt Lake. I watched the game at Blue Star in Evanston and it was a madhouse. Again, strangers becoming friends all over our ‘Cats!